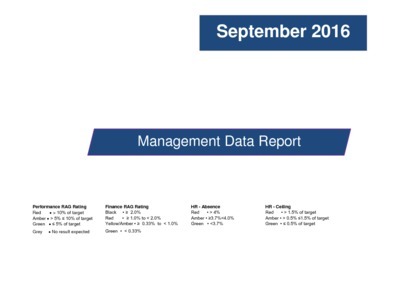 Home > Health service performance report August/September 2016. Health Service Executive. 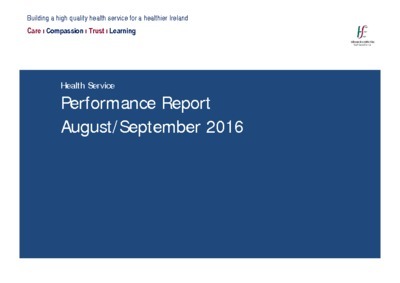 (2017) Health service performance report August/September 2016. Dublin: Health Service Executive. 9,652 patients received treatment (excluding prisons) as of the end of August which includes 4,150 patients being treated by 350 GPs in the community. 665 pharmacies dispensed treatment catering for 6,704 patients. 80 HSE clinics were providing treatment and an additional 10 prison clinics were provided in the prison service. 63 new patients commenced treatment during August (12 in General Practice, 42 in HSE clinics and 9 in the prison clinics). The majority of Opioid Substitution Treatment (OST) KPIs are on target with the exception of transfers. Reasons behind the below target transfer of stabilised clients to the lowest level of complexity (Level 1) from clinics and Level 2 GPs have been discussed at CHO Performance Meetings and will be reviewed through the National Addiction Advisory Governance Group..
We are not in a position to provide a commentary due to a full suite of data not being returned plus there is an issue with the quality of some of the data. See appendix 2: Data Coverage Issues for further details. Due to the roll-out of the new LINK NDTRS database and subsequent issues associated with the changeover have culminated in some CHO areas having an inability to provide the PIs for Quarter 2 2016 on time. The HRB have undertaken to provide full PI Q2 at the same time as PI Q3. The operational plan target is 300 people to be trained in SAOR in 2016. This was exceeded in the first quarter. 7 CHOs are over performing with 1 CHO underperforming. The remaining CHO is CHO 6, which has ‘0’ projection for 2016 and this is the case thus far. The 3 highest over performers were: CHO 2 (+1123%), CHO 5 (+445%), CHO 8 (+791%), CHO 3 is underperforming at -27%. Currently operating at 107 pharmacies which is 12 less than yearly target. Plans in train to recruit additional pharmacies in Cork, Waterford, Limerick, and Kerry next quarter. Note all pharmacists who wish to participated must now complete the accredited training offered in conjunction with the HSE and IIOP in order for an SLA to be offered. The number of unique individuals attending pharmacy needle exchange appears to have reached a plateau at around 1,500 a month (-9% below target nationally) with a slight variance over monthly reporting periods. The number of needle exchange provided remains consistent at around 3,900 a month (14% above target nationally). Ratio of balance of 10 packs to 3 packs is approx 1:1.7. Nationally the average no. of needle/syringe packs per person has declined from last year and may be influenced by a number of factors including clients in treatment accessing packs (this has been reported and discussed at pharmacist training sessions); clients may be getting packs from different pharmacies; and clients may not be regular injectors/users. The percentage rate of needles returned remains below target. Return rates differ in each CHO area which may indicate that culture and geography (distance to the service) may play a role in returns. Drug Related Litter (DRL) reports have decreased which may be due PNex pharmacist education of clients and also due to multi-disciplinary focus groups in place in many areas e.g. Limerick, Cork, Midlands and Waterford. � 11,291 YTD (Target YTD 8,968), CHOs 3 and 6 are below target at -63.2% and -2.4% respectively, the National Quitline is performing above target at 81.7%. � 1,062 YTD, 22.5% ahead of target (Target YTD, 867), CHOs performing below target include CHOs 1, 5, 7 and 8 at 0% variance. CHO5 reported the lowest performance at -60.9% below target.